On Memorial Day, MaintenX pauses to remember those served our nation. MaintenX International tips their (hard) hats to all veterans for their service. We are thankful every day for the brave men and women who fought and died for our country. MaintenX pauses to remember all veterans who made the ultimate sacrifice for our nation on Memorial Day, May 28. MaintenX values the dedication and bravery required to enlist in military service. For some veterans, the transition back to civilian life can be difficult. However, many of the skills and characteristics that make for successful military members are the same skills and characteristics that make for successful technicians. Attention to detail, a don’t-quit attitude and teamwork are all required to provide top maintenance and repair services. For veterans looking to transition from military to civilian employment, there are support services available, like Vet2Tech (http://www.vet2tech.org) which helps connect veterans to employment opportunities in manufacturing and technical careers, like maintenance and repair technicians. With offices in hundreds of cities and services in dozens of areas, MaintenX provides veterans opportunities for employment close to their home base and friends. For more information about MaintenX or to learn about joining the MaintenX team, visit http://www.maintenx.com. MaintenX International is a fully-licensed, facilities repair company. They are one of the largest national self-performing facility maintenance and repair companies in the U.S. MaintenX has created a network of knowledgeable and professional technicians throughout the country. With their team of well-trained technicians, MaintenX self-performs and manages facility maintenance for clients. In the event there is not a MaintenX technician in the area, the company has fostered a network of preferred vendor partners throughout the country to provide superior service for their clients. 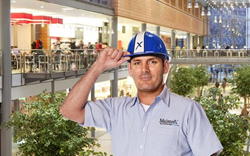 For more than 35 years, MaintenX has been expertly serving multi-location retail stores, restaurant chains, and Fortune 500 companies nationwide.